NOAC in 2015 will be the most attended National Order of the Arrow Conference in history. Looking for a great lodge or chapter service project? Do you want to help build trails for everyone to enjoy? If so, you will probably be interested in participating in the 2013 National Trails Day on June 1, 2013. OA LodgeMaster has recently made an upgrade with version 3.0, with a brand-new and exciting interface. Each lodge in the Order can use this software system to track membership data, leadership positions, event attendances, lodge finances and everything else your lodge needs to be successful. Although NOAC 2015 is over two years away, planning has already begun because this Conference will also be the celebration of 100 years of the Order of the Arrow. 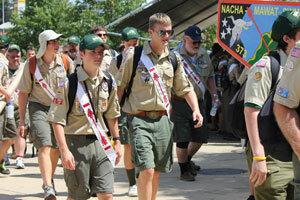 This NOAC is going to be the biggest in the history of the Order, with plans for 10,000 Arrowmen attending. The E. Urner Goodman Award was established in 1969 as a tribute and testimonial to the Order's founder. Its purpose is to encourage and challenge Order of the Arrow members and lodges to increase their effectiveness in promoting and increasing Scout camping in each council.